In recent years, people that seek mold remediation services in Atlanta, Georgia, and elsewhere have increasingly expressed concern about black mold. Black mold is a type of mold that releases dangerous mycotoxins, which can irritate respiratory issues and cause other health problems. 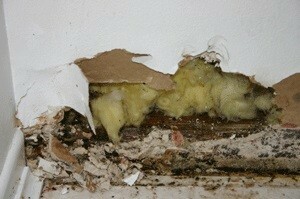 While relatively rare, black mold does present cause for concern if it exists in a space that people occupy. To identify whether you have black mold in your home or business in Atlanta, GA, you should seek the services of a highly experienced mold remediation specialist who can complete a thorough inspection of your property. A qualified professional will know exactly where to look for black mold, and may check in concealed areas, such as behind drywall and under carpets, to determine the full extent of the problem. If you suspect you have black mold in your home or business, contact Abatement Solutions, Inc. As a company that specializes in mold remediation, we have greater expertise than companies that simply offer mold removal services in addition to their primary line of work. We will thoroughly inspect your property for signs of black mold, and if we do identify hazardous mold growth, we will utilize the most efficient mold remediation equipment and methods to eliminate the mold and prevent it from returning. We proudly serve realtors, home and business owners, and property management companies in Atlanta, GA.